Popular Science Blog - Did the Diet Coke/Mentos Guys Just Sell Out? Did the Diet Coke/Mentos Guys Just Sell Out? If you still haven't seen the Mentos-and-Diet-Coke-fountain video that came out earlier this year, congratulations. You are among the few, the proud—the ultimate YouTube luddites. Chances are, though, you know exactly what I'm talking about. Which makes what happened this week all the more interesting. On Monday, Fritz Grobe and Stephen Voltz, the two backyard scientists behind the Diet Coke/Mentos experiment, released a sequel to their original phenomenon as the first Google “Sponsored Video”—a new program from our Internet overlords aimed at sharing ad revenue with marquee videographers. 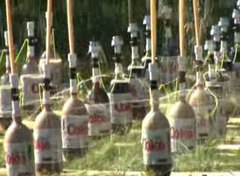 The new video (see below), in which the lab-coated duo initiate a domino-effect chain reaction with their famous two-liter Diet Coke fountains, features prominent linkage to coke.com and mentos.com, followed by a short message urging viewers to enter a coke.com-sponsored contest by submitting their own Mentos/Diet Coke–related footage. The new Google program presents another potential solution to the challenge underlying the explosive popularity of online video: finding the best way to make money from the immense mishmash of user-generated clips. Grobe and Voltz made $35,000 on their first video’s massive viral success via Revver, a YouTube–like site that serves an ad at the end of each video and splits the revenue generated with you 50/50 based on how many times your clip is viewed. The financial details of their current deal with Google, Coke and Mentos are, so far, unavailable. Unlike Google’s revolutionary AdSense service, which capitalizes on small amounts of targeted-ad revenue collected by millions of smaller sites across the Net, Google video sponsorship will be available only to large-scale content providers with more than 1,000 hours of content or broadcast exposure. Nonetheless, great find. I always red the blog and website, and I suspect that I will soon get a subscription to Popular Science Magazine. Your sites, magazines, blogs, and other things write such fascinating things. I'll bet the ants are ecstatic. Um, so what happens if you eat a Mentos afte drinking Diet Coke? This is a gr8 video! I was really amazed after watching this video! P'raps i can do this for someone's b'day...or maybe i should call those 2 diet/coke guys! Aw!!! All that Diet Coke... wasted!!! You could have fed me for a year!! Amazings experiments.. yeah i also see two australians mixing Coke and gasoline with mentos and fire. it is not good experiments.. nice work and done..
Can you say a total waste of time? Whatever happened to performing experiments to discover something new that in some way benefits the world? Now, we are all about stupid useless tricks that do nothing for anybody. Calling this an experiment is a stretch. More a like a bunch of yahoos who could not cut it in school to get a real education in science. PopSci should know better, before blogging crap like this. You are right, what was I thinking. It's difficult to study the long term impact... for websites like theirs it's very difficult to repeat that... How do you cash in on a one time phenomenon? Unfortunatly, the splitting of the services is like a lot Google's new offerings, too. The smaller websites/bloggers get poorer quality offerings, lower revenue, and more hassle. Adsense is becoming like that, too. the link below for anyone interested. To say that the film tests the boundaries of documentary ethics would be a thundering understatement. The Red Chapel challenges every documentary ethic known to the film-making world. Putting Pak at the center of his narrative, Brügger describes her as a military interrogator based only her use of rudimentary English (nevermind the question, who in Korea is teaching English besides state propagandists? Man i have been following the diet coke and mentos experiment. I don't know how those scientists managed to submit those volcanic experiments to coke.com and mentos.com. Aren't these website owned by those respective brands. Why would they feature it if it harms their brand image. Whether they sold out or not, doesnt matter, that video was pretty impressive! Dont know how they would top that. But as they said - wayyyyyyy too much free time. You have to give it to them, that would have taken a lot of planning - and some of those fountain effects looked amazing!